During President Obama’s address to Congress in November 2009, Representative Joe Wilson of South Carolina shouted, “You lie!” As Jack Cashill details, the president has been lying about his personal history and his political philosophy from the beginning of his political career. Yet throughout his meteoric rise and the first five years of his presidency, the liberal media turned a blind eye to his numerous evasions, contradictions, misstatements, deceptions, untruths, and outright falsehoods. It wasn’t until the disastrous Obamacare rollout that the president’s lies caught up with him. Finally, it was impossible even for the mainstream media to ignore the president’s repeated assertions that all Americans could keep their health care plans and family doctors if they so chose. 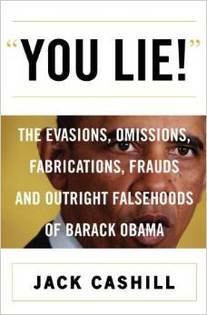 In You Lie!conservative journalist and author Jack Cashill provides a devastating compendium of the president’s false and misleading statements on matters great and small, from the deliberate distortions in his celebrated memoir, Dreams from My Father, to his rise to the White House and his years as president. Jack's latest book is If I Had a Son: Race, Guns, and the Railroading of George Zimmerman.